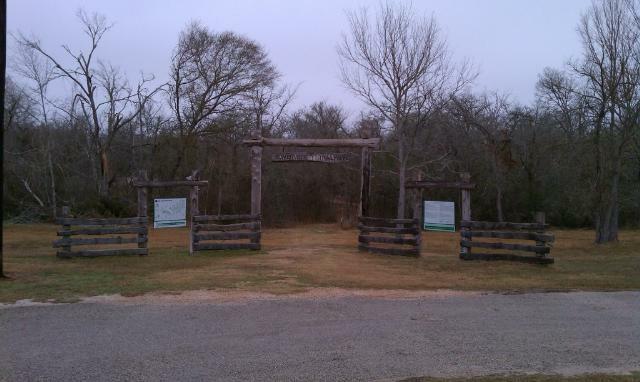 The start of the trail at Nails Creek features this impressive gate. Lake Somerville is one of those Texas State Parks that is broken up into two units, each taking up part of a peninsula on either side of a man-made lake. These two units are not entirely disconnected though since they share termini of a 13 mile trail that runs between them on the western side of the lake. The trail is wide and easy to follow. 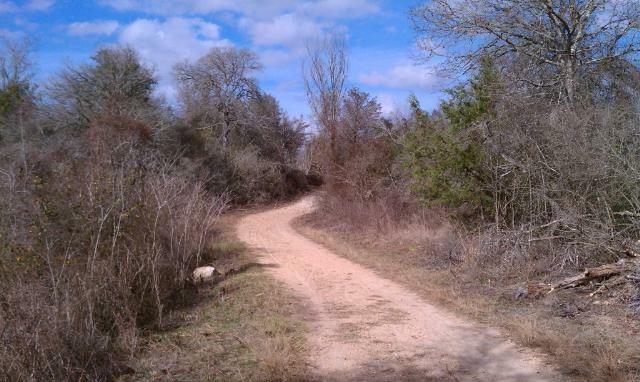 A jeep or truck can easily navigate the path and that's probably how the park maintains the facilities along the trail's route. The trail surface is mostly jeep trail, so it's wide and easy to follow. Since the trail mostly follows the edge of a lake common sense would indicate that this means there would be little elevation gain through its length and this turns out to be the case. Where the trails follows small ridges overlooking the the flats on which the lake lies there's a little bit of up and down. 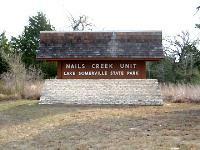 However, this is an easy enough hike for hikers or any age. Horses are allowed on the trail, so if you are nervous around them you might want to look elsewhere. Horse manure, or lack thereof, indicates that riders don't make use of this trail as much as they do others, such as McKinney Roughs. The waypoint marked "Bird Blind" at the northwestern edge of Flag Pond is an excellent place to stop for lunch. It's off the beaten path and there are plenty of picnic tables on which to eat. In the spring you might also be able to spot a few birds. Strangely, though the covered shelter here looks relatively new the surrounding vegetation looks like it's already moving in for the kill. 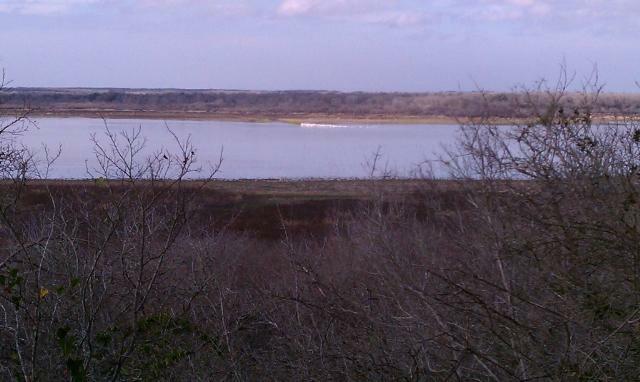 Lake Somerville with a flock of birds in the distance. 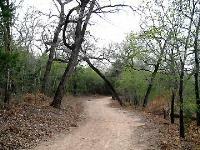 Private land and homes often come very close to the trail where it skirts along the edges of park and preserve boundary. This is most apparent when the trail hugs the southern boundary of Flag Pond. Numerous homes and fishing or hunting camps line the shore just on the other side of boundary fence. It's easy to see why they'd choose to build here since it represents some of the nicest views along the trail. Unless you are anxious to hike every inch of the trail I'd recommend avoiding the Flag Pond Look Trail segment along Flag Pond's northern shore. It's little more than an earthen berm rising above the flats on either side of it. There is little in terms of nice views of the lake since the brush is higher here. The southern pond shore along the main trail is much more scenic. Yegua Creek marks the halfway point between the Nails Creek and Birch Creek units of the binary park pair. There's a parking area here along with a self pay station. Some hikers have pointed out that there's very little here in terms of scenic views and certainly there's some truth in that viewpoint. The flat terrain does not lend itself to sweeping vistas. The dry conditions and lower water levels are probably not helping to draw more birds to the area. If there were more avian visitors that would be a big draw for many.